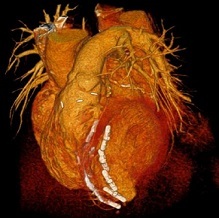 A multidisciplinary team of UPMC physicians, including McGowan Institute for Regenerative Medicine affiliated faculty members, recently completed the first Less Invasive Ventricular Enhancement™ (LIVE™) procedure in the United States to treat patients whose hearts can no longer pump enough blood to the rest of their body due to coronary artery disease. Ischemic cardiomyopathy, as this condition is known, is one of the leading causes of cardiac death. The condition results when damaged muscle from previous heart attacks prevents the heart from pumping the necessary amount of blood to the body. The scar tissue that develops following the heart attack can lead to an abnormal shape and size of the left ventricle and impaired overall heart function. Dr. Toma worked side by side with McGowan Institute affiliated faculty member Christopher Sciortino, MD, PhD, surgical director of UPMC’s Advanced Heart Failure Center, along with anesthesiologists and advanced imaging specialists, to use the Revivent TC™ system from BioVentrix Inc. to bring the left ventricle back to its normal shape and size. The Revivent TC system uses a minimally invasive approach to attach small anchor pairs to the inside and outside of the heart. The anchors pull towards each other, synching any scar tissue away from the heart’s remaining functional tissue, bringing the left ventricle closer to its regular formation. The LIVE procedure was approved in Europe in 2016, and UPMC’s surgery was the first in the U.S. under a protocol that allows the Revivent TC system to be used as an investigational device in a multicenter clinical study to collect safety and effectiveness data. To date, 130 LIVE procedures have been performed worldwide. More information on the LIVE procedure is available on the BioVentrix website, and information about heart failure is available on the UPMC Heart and Vascular Institute website. Illustration: Less Invasive Ventricular Enhancement (LIVE) uses metal anchors to fold over the scarred portion of the heart and fasten it in place. UPMC.